Rachmaninov plays and conducts, vol.2. Schubert, Bach, Scarlatti, Daquin, Hendel, Gluck, Mozart, Beethoven. The leonine aristocracy of Rachmaninov's playing, the perception that this is playing unfettered by limitation either digital or technical, is present throughout these discs. They reflect an aesthetic that is frequently personalised to a remarkable degree, most especially in Mozart and Schubert, but that can be channelled with remarkable imagination and flair when joined by a personality of equal stature - in this case Kreisler in their sonata recordings. The clarity of his voicings in Bach was legendary, the absorption of the violinistic by the pianistic in the Partita BWV 1006 a marvel of creativity and suggestibility. Yet when he moved from elevated Bach to hyphenated Scarlatti-Tausig his capricious rhythm was equally captivating and his Harmonious Blacksmith, another plaything for Golden Age pianists, emerges as deliberate and clear and not at all hammered out, gathering strength as it goes, reaching that single apex of Rachmaninovian intensity. His Mozart (two movements from K311) is gloriously romantic, full of sly humour and utterly indefensible - with a Rondo alla turca that defines the word emphatic as well as any dictionary. The Gluck-Sgambati is beautifully done and without much pedal (as is the temptation) - though it doesn't, for me, efface Egon Petri. And yet as if to confound the issue his 1925 Beethoven-Rubinstein Turkish March does use quite some pedal but manages effortlessly to highlights the saucy humour. Rachmaninov as a pianist represents a uniquely outstanding phenomenon. With his great temperament and a powerful tone he could conquer any audience. His performance, technically impeccable, clear and clean, was notable by its sincerety while an iron rhytm reigned over the whole performance. The value and power of Rachmaninov is in his imagination, that is in perceiving into his soul the musical images of the original pieces of music. 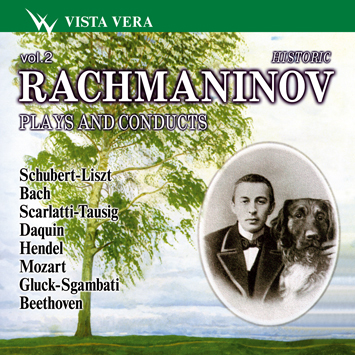 Cover: Sergei Rachmaninov with his beloved dog Levko which was killed by the peasants who revolted and ransacked his family estate Ivanovka in October 1917. Photo 1899.